Running time 20 minutes approx. 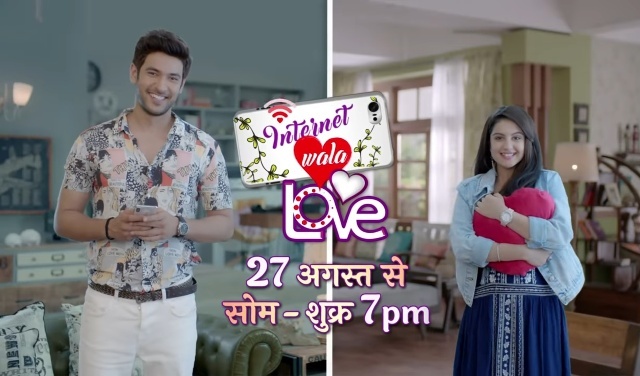 Synopsis: The TV Show Internet Wala Love is an upcoming Indian Hindi TV Show to be aired in the popular channel Colors, which will be seen on 27 August 2018. The TV Show has stars like Shivin Narang and Tunisha Sharma in the pivotal roles. The TV show was produced by Sunjoy Waddhwa under production banner of Sphere Origins, while the TV show was distributed by Viacom 18. This will be the first season for the said TV show based in the UK called e-Love. The TV show talks about a couple who is in love with each other over the couple who come across over the social media and then meets along with their alliance. The said TV show will be aired on Colors TV sharp at 19:00 and will be a five day TV show starting from Monday to Friday. It is going to replace the TV show called ‘Tu Aashiqui’, which has now been shifted to 18:00. In the UK, we have seen ‘Tu Aashiqui’, which is expected to remain in the 20:30 slot, while the telecast time for the ‘Internet Wala Love’ in the UK is not confirmed as yet. Both the characters Jai played by Shivin Narang and Aadhya played by Tunisha Sharma are very much opposite to each other. Jai is often seen dwelling over social media and keep his life like an open book, having disclosed all his chapters and verses, while Aadhya on the contrary is seen wary about the internet and limits her interaction over social media. This show happens to be a quirky one while it has a playful story, which explores their own story and that what happens when their roads cross each other. The makers have released the promos and these are getting good reviews on the social media thus creating a good buzz for it. Stay tuned to know more about it.